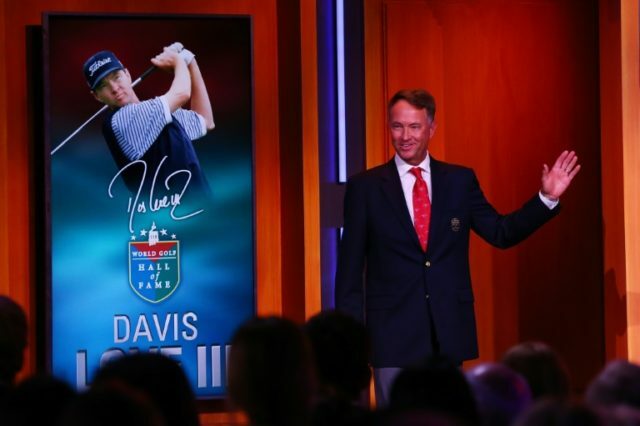 New York (AFP) – Two-time US Ryder Cup captain Davis Love, hailing golf as a game that “has improved my life in every way, was inducted into the World Golf Hall of Fame on Tuesday alongside Ian Woosnam, Lorena Ochoa and Meg Mallon. The four players were welcomed to the hall along with the late British golf writer Henry Longhurst in a ceremony in New York City held in conjunction with this week’s Presidents Cup. Love, who won his lone major at the 1997 PGA Championship, was introduced to the game by his father, a respected teaching pro who died in a plane crash just as Love was establishing himself among the professional ranks. He held his granddaughter in his arms as he called the induction “the greatest honor of my life”. Love was 51 when he won his most recent US PGA Tour title two years ago. Mexico’s Ochoa opted to retire in 2010 when she was 28 and still ranked number one in the world. She recalled her husband, Andres Conseca, taking her to the World Golf Hall of Fame in Florida 10 years ago — and predicting they’d return with their family to see her enshrined there. Wales’ Woosnam, introduced by South African great Gary Player as a “wee giant” recalled his 14-year-old self telling a member at his club in Wales that he wanted to be a professional golfer. “He tapped me on the head and said, ‘Well, if you want to try to achieve all that, you’re going to have to grow a little,’” Woosnam said. “I did grow a little – about four inches,” added Woosnam, whose small stature was no impediment in a career that included a 1991 Masters title and a 50 weeks atop the world rankings. “Woosie” was a European Tour Order of Merit winner and a two-time European Player of the Year. A five-time Ryder Cup winner in eight appearances as a player, he captained the victorious European side in 2006. Mallon, whose 18 LPGA titles included four majors, recalled the support of a large family and her tennis champion mother’s encouragement. And she remembered her own youthful single-mindedness, which drove her to practice hitting balls against the wall of her Detroit home.